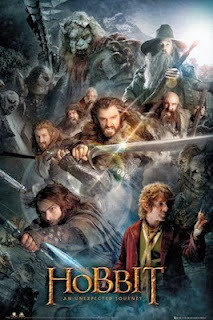 The Hobbit: An Unexpected Journey premiered on TMN, so J and I gathered our popcorn and blankets and snuggled in to watch. He commented that he’d not heard much about how good or bad the movie was and I realized that, aside from Tumblr praise, I really hadn’t noticed much talk about it. Then again, Peter Jackson isn’t really doing anything new with this film (though he's some how managed to turn a single book into three movies). The oohs and aahs were already taken up by the epicness of the LOTR trilogy, so The Hobbit was merely retreading old ground with a different story and characters. So did it work? Yup. We enjoyed it, with particular appreciation and subsequent anticipation for Smaug, whom Jackson carefully avoided revealing. Dragons have been done in film before and done very well, so I suspect The Desolation of Smaug is going to try to blow all the others away. We shall see. Since this story actually comes before LOTR, it all plays out very amusingly and differently, knowing what we do about the future. For one thing, Gandalf’s machinations seem ever so slightly more obvious. Though he didn’t know about the One Ring until he saw Bilbo with it, it felt like Gandalf had been very busy plotting out this entire story himself, beginning with his blissful obsession with hobbits. 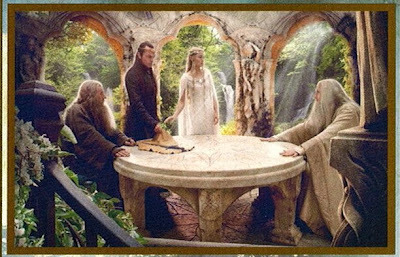 We were also amused by the meeting of the Jedi White Council where Saruman’s lines basically amounted to “blah blah blah” while the important people who haven't been staring at palantirs spoke. If poor Christopher Lee was upset about his deleted scenes in LOTR, he really must have cried over this. Are you guys even listening to me? Finally, I spent a lot of time giggling over Gandalf stealing all the XP (though I questioned his actual power as a wizard since it mostly just involves being around when the sun is brightest) and J made a weapon upgrade reference when the kids find their new elf blades. Eventually, I found myself unable to watch the movie at all without seeing how every possible (fantasy) RPG has stemmed from this story. We know JRR Tolkien has influenced many writers and their subsequent epic fantasy novels, but I can’t help but assume that LOTR and The Hobbit are required reading (and now watching) for anyone hired to work on such a game. It’s not just about the races and settings, but the entire quest process, party members, classes, enemies – and I see you there, level grind!